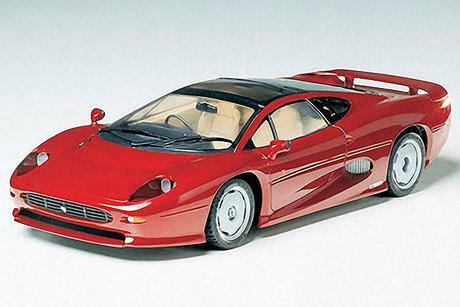 Three years after their first concept car was unveiled to the public at the 1988 Birmingham, England Motor show, Jaguar"s sensational XJ220 went into production. Only 350 of these mid-engined, two door, two-seat coupes will be built, with the first ones becoming available during early 1992. The dramatic body styling of this Jaguar is aerodynamically functional as well as presenting traditional Jaguar elegance. Race developed and proven for wheel independent suspension with unequal wishbones, inboard concentric coil springs and Bilstein damper units ensure precise and predictable road hugging and handling throughout the car"s speed range. The undersurface is fully cowled to produce a full flat bottom, with the rear end provided with a diffuser for attaining optimum ground effect. The interior reflects Jaguar"s typical luxurious approach for the utmost in driver and passenger comfort. It is styled in ergonomic efficiency combined with abundant leather appointments. Instrumentation feature analog gauges that are naturally comprehensive. The Jaguar XJ220 successfully combines leading edge technology, outstanding performance and established Jaguar quality.